By Eric Guel on November 4, 2010 Visit Eric's Website. Shortly after my wife Brandi and I got our first flock of chickens (circa July ’09) we obtained a few Muscovy ducks as well. We had heard that Muscovy hens are good mothers and they have no problem going broody—we were not disappointed. As soon as spring hit this year, our Muscovy mama started dropping eggs all the time and it wasn’t long until she had a clutch of 14 eggs or so. Like a good bird she quickly went broody and roughly 30-something days later, she hatched a flock of baby ducks. Very cool. Now while we love our ducks, we really love our chickens, and somewhere down the line I got a harebrained idea to throw chicken eggs underneath our mother duck to see if she’d hatch us some chicks. The great Muscovy Foster Mother experiment worked, but I wouldn’t say it went off without a hitch. We were actually somewhat surprised when our duck hen went broody again. You see, she had already raised a dozen babies in the springtime and we weren’t quite sur e that she’d be interested in going at it again. But sure enough, a few weeks ago she started laying eggs again and within a few days she was sitting on a nice clutch of roughly a dozen eggs. We quickly swiped her duck eggs from underneath her and replaced them with fertilized Delaware breed chicken eggs (thanks, of course, to our always amorous rooster). The duckess (I just made that word up) seemed a little suspicious at first, and I can’t say I blame her. We had taken her enormous off-white duck eggs and replaced them with 14 brown chicken eggs. What did we take her for, some kind of birdbrain? At any rate, she gave her new clutch a sidelong look and hopped right back on. She was none the wiser. The clock was ticking. If all went well, we’d have a flock of Delaware chicks in a mere 21 days, give or take a day or two. On day 17 (roughly), Brandi noticed that one of the eggs under the duckess was rotten. She tossed it. We were down to 13 eggs. On day 20 (give or take), she noticed that there were only 12 eggs, not 13. We assumed a pesky snake took an egg, but we had no evidence, just a theory that happened to fit the facts. We kept an eye out, but since we generally like to sleep at night, I can’t say our “keeping an eye out” was very effective. Thankfully we were close to hatch day anyway. 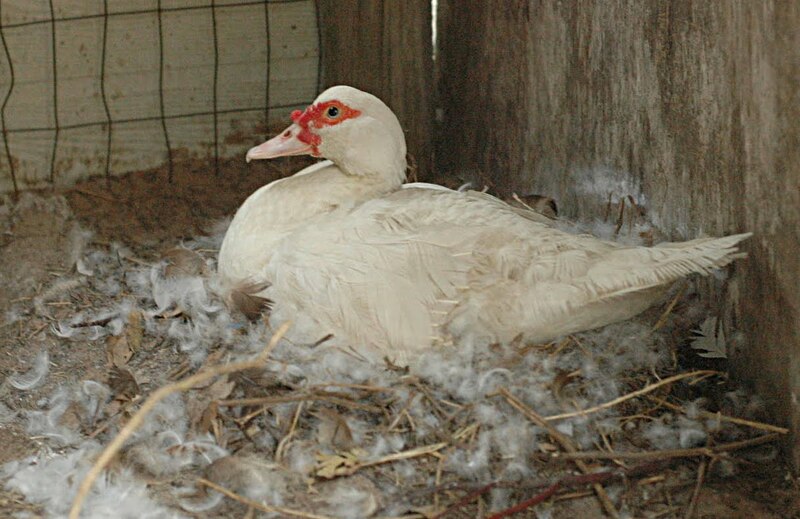 On day 21 (approximately), Brandi noticed a half-hatched dead chick by the side of the duck’s nest. After a close inspection of the nest, she noticed another half-hatched dead chick actually in the nest. Yikes! Apparently the duck mama wasn’t so keen on raising chickens. Was she killing them as they hatched? Stepping on them? Suffocating them? We’ll never know. What I do know is Brandi called me at work and queried, “What do I do?” I responded, “Um … I don’t know.” After my initial genius-like reaction, I said, “Why don’t you take all of the eggs out of the nest and put them under a heat lamp? 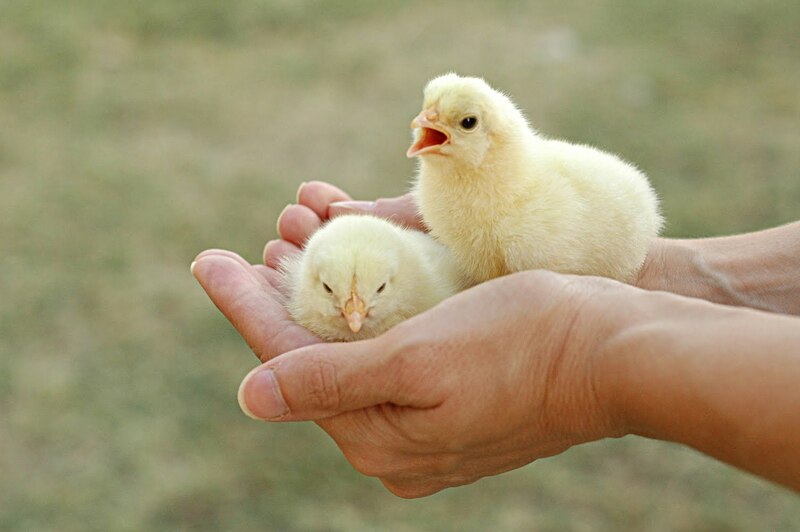 They’ve got to be all ready to hatch anyway.” Our hopes were not very high at that point. We were down to 10 eggs and we weren’t feeling very lucky. Thankfully, after a few hours under the heat lamp, coupled with some constant moisture, we had our first chicken hatch. We were ecstatic! And within 24 hours, seven of the 10 remaining eggs had hatched. We deemed our mission a successful failure: the mama duck had brought the chickens to term, but didn’t go all the way with it. While we’re thrilled to have seven new chicks (that’s two of them in the photo), and while we were glad to have tried the experiment, we think our days of using a Muscovy hen as a foster chicken mother are over. We’ll let her stick to doing what she does best: making duck babies. actually you hit the key here. she was killing them she had already raised a clutch. she also was not a new mama which means she new what her babies should have been. although with our ducks they seem to be happy as long as we don’t mix the eggs of the clutch. i have two new mama s right now that has hatched and raised and raising guinea keets. so far the only problem i have run into with Moscovey hatching is don’t put two different eggs under her. she pushes off the ones she knows is not ducklings. will be trying chicks road island reds next. hope i have the same success as the other two hatches. thanks for posting this for sure. Very good! I have had the similar difficulties with my ducks that share the living quarters with the hens. I also have some banty hens that will sit on almost anything and have hatched our ducklings along with their chicks. It is quite amusing when the ducklings decide it is time to paddle and ‘mother hen’ is on the side lines having a mini fit! Eventually Mother hen gives up on her strange children and a duck takes over. Duckess? A failed success story? I love your writing style! Can’t wait to read more.